The Engineering field is one of the most cherished field of study when it comes to tertiary education. It’s an interesting discipline with diverse branches. Whichever branch/department you settle for, be rest assured it will surely pay off at last. One very amazing branch of engineering which perhaps is not gaining much recognition is the Automotive engineering department. Engineers in this field can design new vehicles or look for ways to improve existing automotive engineering technology. Automative engineering can be studied in any level; depending on the school. But in this article, we shall be pitching our tent on Masters level. As a student earning a Master in Automotive Engineering, you will gain the important knowledge and skills to build, test and repair vehicles. As part of a Master in Automotive Engineering program, students can specialize in areas such as aviation, energy and transport, green engineering, transportation design, and automotive systems. Automotive engineering is a complex and interdisciplinary field. To study automotive engineering, visit the official webpage of any of the listed schools. The HAN University of Applied Sciences, often abbreviated as HAN, is a vocational university of applied sciences with campuses in Arnhem and Nijmegen in the Netherlands. It offers bachelor’s and master’s degrees in a wide range of subjects. At HAN University of Applied Sciences, theory and practice are seamlessly integrated. During the Masters in Automotive Systems, you put theory into practice during the ‘minor projects’ and during applied research for your Master’s thesis. Research is geared towards solving an actual issue from industry. So knowledge and techniques from fundamental research are applied in an industrial environment and implemented in automotive systems and vehicles. This collaborative approach strengthens ties with industry and stimulates the exchange of knowledge. As a result, professional practice is constantly renewed and you benefit from a Masters degree that perfectly matches industry needs. As an automotive engineer, you are involved in the design, development, production, and evaluation of vehicle systems and components. With the further qualification of a Masters degree, you also possess valuable skills in applied research, communication, and management. This enables you to lead projects while balancing engineering, economical and commercial interests. Moreover, you have the technical expertise to evaluate and realize underlying control strategies and embedded electronic systems. The combination of these skills makes you highly employable in this industry. 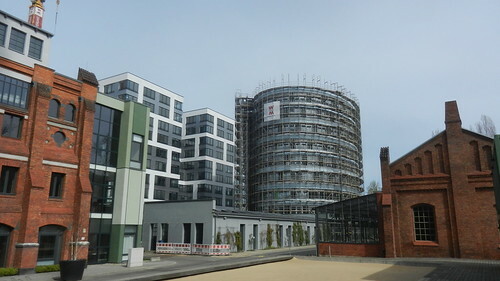 TU-Campus EUREF, located in Berlin-Schöneberg offers continuing/further education and postgraduate classes and seminars for diverse target groups, research and consulting support and most importantly postgraduate master programs and further education modules that relate directly to the themes of energy transition. The Technical University of Berlin is a research university located in Berlin, Germany. Beginning in the academic year 2017/2018, the Technical University of Berlin (Technische Universität Berlin) is offering a new master’s program on Sustainable Mobility Management on the EUREF Campus in the center of Berlin. The course targets transport engineers, transport and mobility experts, planners, architects, and sustainability project managers who want to gain in-depth, special knowledge in the field of sustainable mobility management. The growing environmental impact of transport systems, as well as their energy voracity, requires new approaches and new concepts. This MBA offers an integrative design across disciplines, addressing a range of different perspectives. The theory and practice-driven approach gives students both a conceptual understanding and the skills needed to tackle practical problems, covering the needs of strategy development, analysis, and implementation, complex decision making and project management. Please note: The application deadline is May 31 of each year. Politehnica University of Timișoara, is a public university founded on 11 November 1920. Located in Timișoara, Romania, it is one of the largest technical universities in Central and Eastern Europe. The university’s research and scientific training is based on the strategy of promoting multidisciplinary research and the priority given to new technology. The Master in Automotive Embedded Software is a two-year study programme taught in English which provides advanced knowledge in the field of automatic systems engineering applied to automotive embedded software. Graduates gain both a theoretical background in the field and the methods of practical applications in order to offer complete solutions to practical problems in embedded systems. They know and understand a wide range of technical applications, and they master advanced skills and competencies in the design and implementation of embedded applications dedicated to high complexity automotive systems. Innovative solving of core problems in inter-disciplinary co-operation and team-working. Their jobs involves the management of complex tasks in the field and inter-disciplinary cooperation. In addition, graduates acquire innovation and research skills and can focus on research and development of new products. This accredited degree combines a firm grounding in the principles of automotive engineering with experience of cutting-edge technology. Led by WMG (Warwick Manufacturing Group) and developed in collaboration with industry leaders including Jaguar Land Rover, BMW and Ricardo, the course highlights research breakthroughs such as the WorldFirst Formula 3 friendly car, hybrid vehicles and ‘lightweighting’. You will study core automotive modules alongside flexible optional modules and will benefit from industrial visits and input from firms such as Tata Steel. There are also many opportunities for individual and group project work on topics such as gearbox analysis, examining flywheel energy storage, and developing both electric and internal combustion-powered IMechE Formula Student racing cars. You will build skills in research, design and innovation, communication and leadership, and will adopt a multidisciplinary approach to solving engineering problems, allowing you to work in many industrial sectors. In your first year, and into your second year, you will develop your understanding of core areas of engineering with options to specialise in automotive engineering via laboratory and design work, and optional modules that address areas such as design for manufacture and vehicle technology. In your third year, you will complete individual project work alongside further engineering and manufacturing modules covering topics including CAD/CAM, automation and robotics, vehicle safety, and quality techniques. You can gain industrial experience during your course via visits and project work. The School encourages students to undertake some form of industrial experience. Many students undertake internships and other work experience over the summer. Some students can take a year-long placement in industry or in a research environment. A level A*AA, to include A level Mathematics and Physics. A-levels in applied subjects and mixed portfolios: Candidates are considered on an individual basis. Grades will be similar to those for candidates taking academic A and AS qualifications. Applicants with a strong profile but without either A Level Physics or A Level Mathematics may be considered.